You do not feel safe because you are thinking way too much. 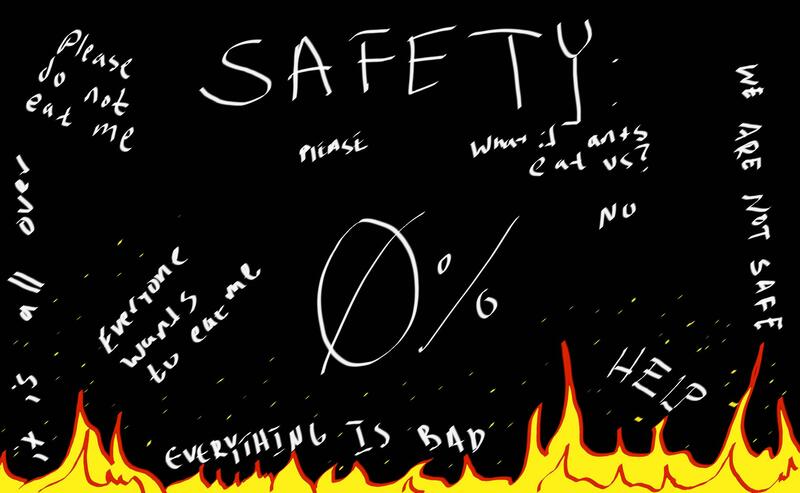 You are at a 0% feeling of safety. You lay there and think about being a bear. And how you have always been a bear for as long as you have been a bear and you do not know anything about being an anything else at all. You are just a bear. But one day you will not be a bear probably. And then what? What happens to you and your bearness and everything you have worked hard to be and to know and to love and to think about? where does it all go? You remember the expression of the mangled squirrel you saw on the long, flat black rock once, its tiny skull being splayed about as its fuzzy face was worn by the heartless rock formation. Its expression was blank. Empty. Scattered and destroyed. Would you be that one day? Would you be the squirrel with the shattered everything? While you dwell on the inevitable nothingness of everythingness, you see the hawk above flying toward you. It sees you notice it and flies off. You are hawk-safe, but you are not bear-safe. Will you ever be safe? Is anything that is devastating avoidable?